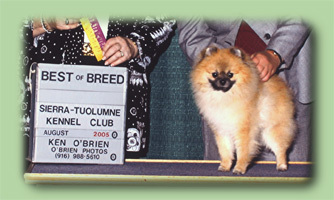 Townsend Pomeranians is a breeder of champion Pomeranians. 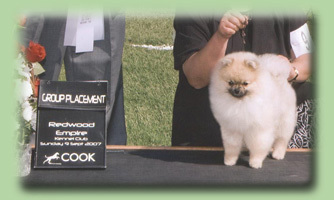 Our breedings are carefully planned in order to attain our goal of breeding our next show Poms with sound structure and movement, harsh coats and outgoing personalities. In order to keep our numbers small, we occasionally have Pomeranian puppies or adult Pomeranians available for sale as show prospects or pets. Our pet Pomeranians are of same pedigrees as our show Pomeranians and are placed as valued companions to the appropriate pet home. Townsend Pomeranians is located in the San Francisco Bay area. We are a member of both the Northern California Pomeranian Club and the American Pomeranian Club. We hope that you enjoy your visit with us and come back again. If you have any Pomeranian related questions or would like more information on our Poms, please e-mail us at townsendpomeranians@hotmail.com. Thank you for visiting our website.